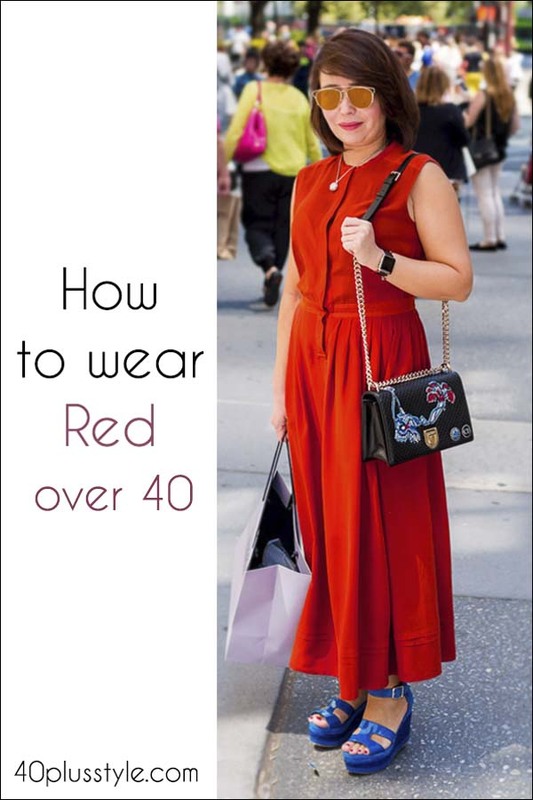 40+ Style » How to wear color » How to wear red – your comprehensive guide on wearing the color of love! 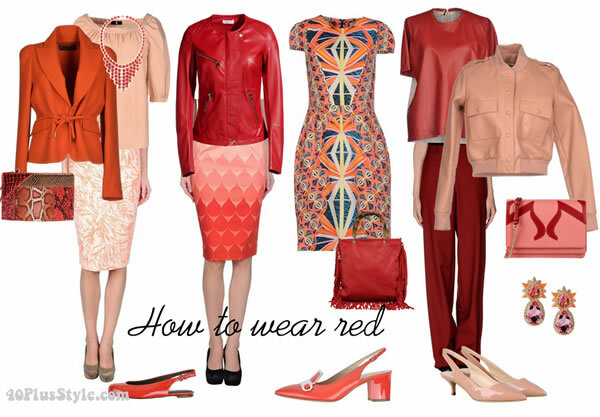 How to wear red – your comprehensive guide on wearing the color of love! I often talk about adding more color to your wardrobe. One really fabulous color to add is red. The color of love. 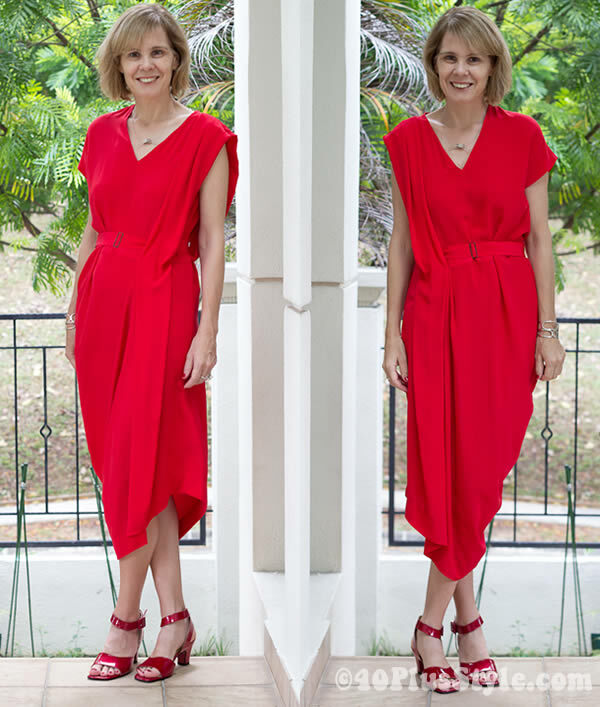 In this article I will show you how to wear red in many different ways and we will also show you how you can find your right shade of red. The color red is especially good for women with a warm skin tone like myself, as it brightens up your complexion and makes you shine even more. However, even if you have a cooler skin tone, you can still wear this color and look amazing. There are many ways to wear red. Red makes an impact. When you wear red, people will notice you. Red is also a very versatile color. Easy to combine with black, white, blue, camel and so many other colors. I’m growing ever more fond of red and have learned to embrace the color for myself. You can can wear red in a subtle way by wearing a red accessory or you can make a bolder statement with the color. Whatever your comfort zone with the color red, there is a way to add this color to your wardrobe for everyone. Let’s explore all the different ways on how you can wear red! Wearing a bold color like red with just one other color is your easiest option and one of the nicest and easiest options by far is to pair it with white. It’s also one of my favorite combinations. Wearing a red top is my most used choice for wearing red. Nothing brightens my face and makes me come more alive than wearing red close to my face. 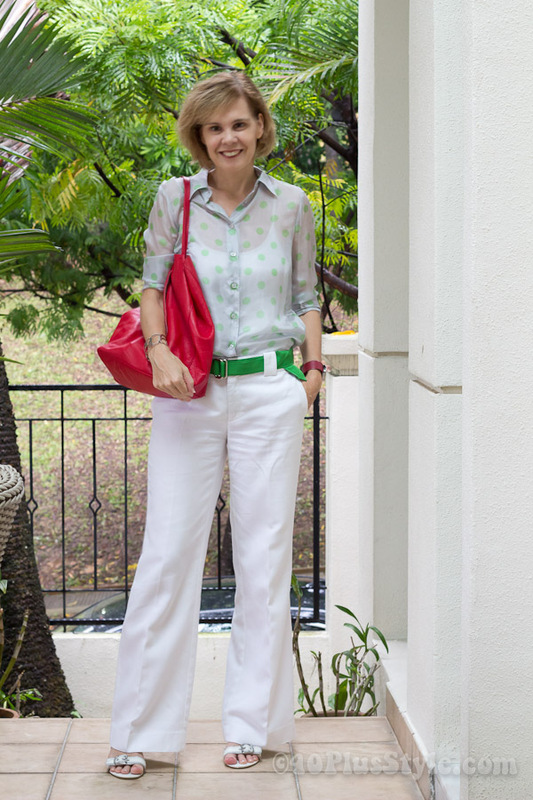 I have several red tops in several colors that I wear with both pants and skirts. 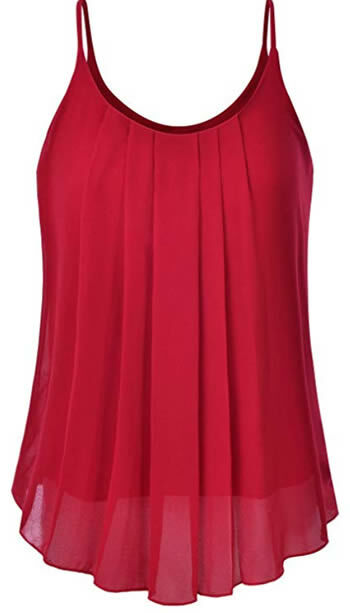 The pleated red top below is great at hiding the belly and can be worn on its won or with a jacket. If full on red is too much for you you can consider a printed top that includes red to soften the look. 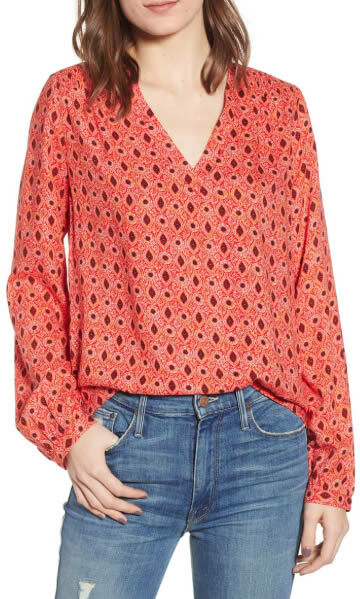 This blouse comes in several prints and also in solid red. A red dress makes a statement on its own. This versatile piece will look great with the right statement necklace. But it can also be worn over skinnies and leggings. If you’d like to include red as part of your style but want to do it in a subtle way, red accessories are the way to go. 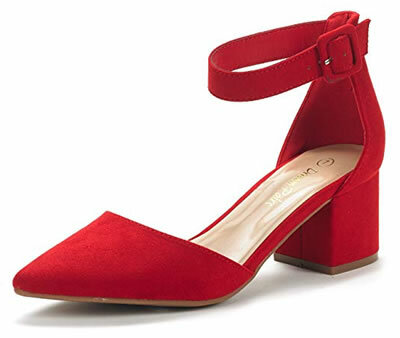 Red add a bit of polish to your look and red shoes can each outfit a lift. These shoes are stylish and comofrtable. 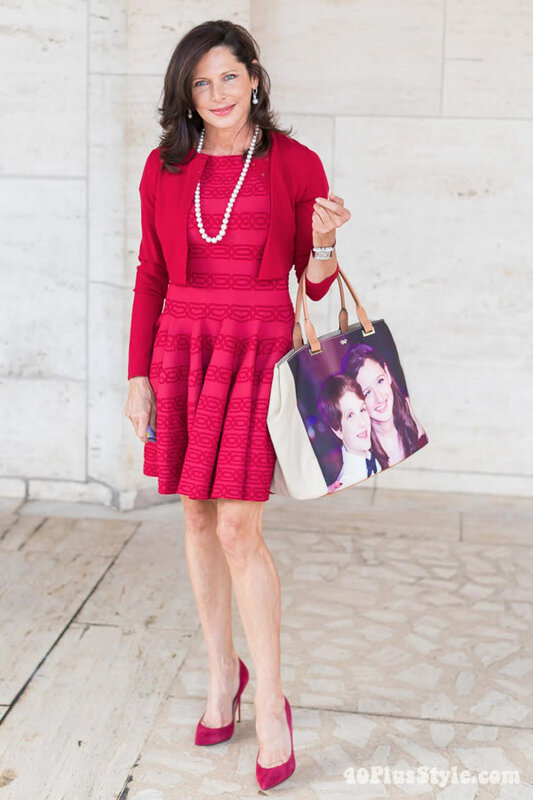 A red bag can give an otherwise monochrome or neutral outfit a lift. This clutch bag that can also be worn over your shoulders is the perfect accessory. 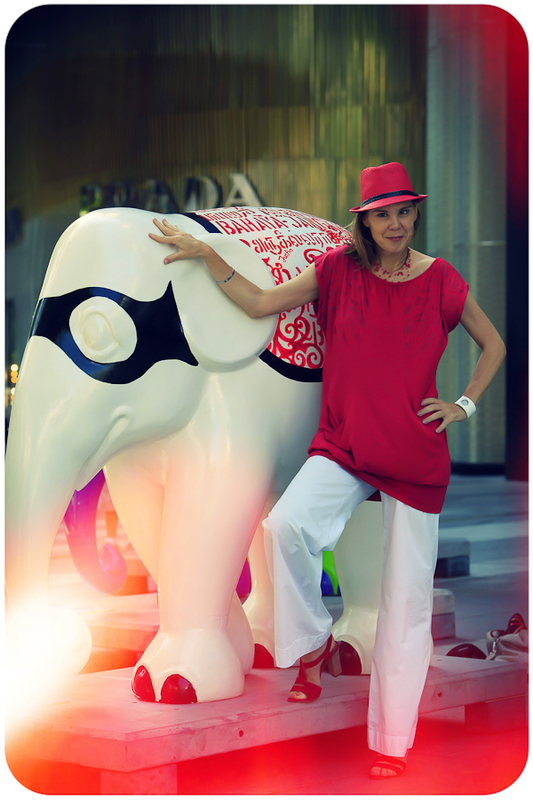 Are you looking for more creative ideas on how to wear red? If I like to get more ideas on how to combine a certain color and create really interesting combinations, I go to colourlovers. 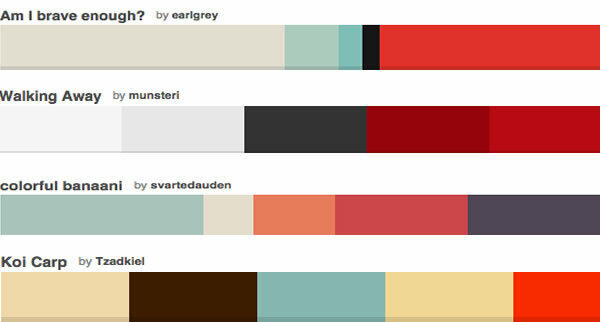 This tool allows you to see many color palettes immediately and will give you lots of ideas. Just search for red in the colour palettes search box and you will instantly get lots of different options. Here are some great color combinations I found. Another way to get inspiration for a great color palette or the colors for your outfit is to look at an image that you love. I was struck by this image from Yoox. This image actually inspired this article! I just LOVE this color combination and feel that it’s the most current and hip way to wear red right now. So I took this picture into Colourlovers and created a unique color palette from this image. This color palette is the main inspiration for the shopping options I will give you today as I feel this combination looks chic, modern and special. I’m very tempted by many of these items, but I actually think I have the building blocks available in my closet to create this look, so stay tuned! 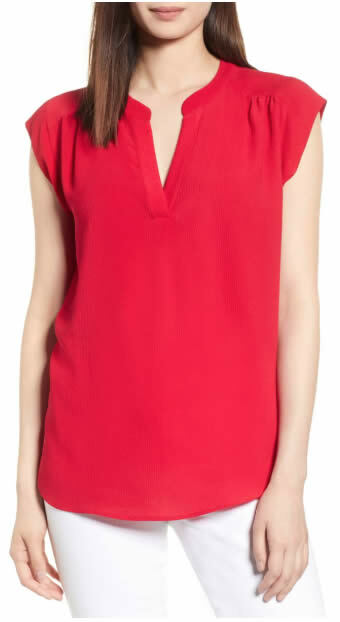 A loose cropped red top from Stella Carakasi which you can layer with tops underneath. More details on this look. 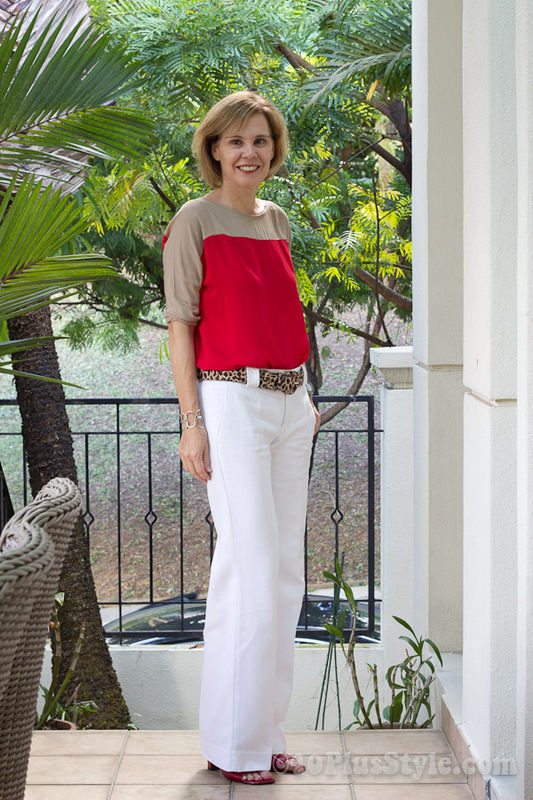 A refreshing red and white look for spring and summer. You can also wear this color combination during transitional weather. 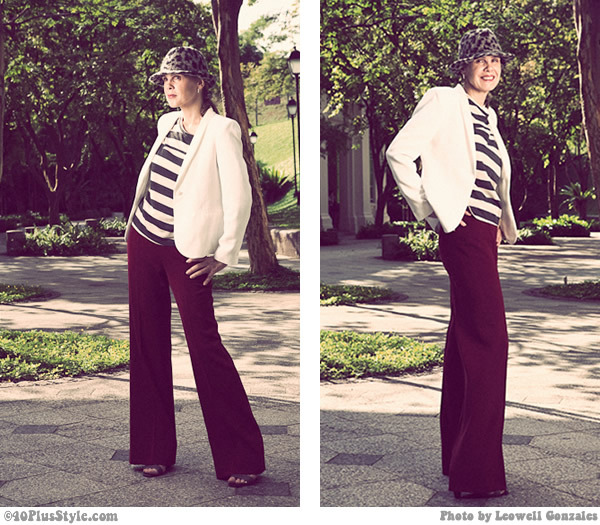 With wide leg cropped pants. More details on this look here. 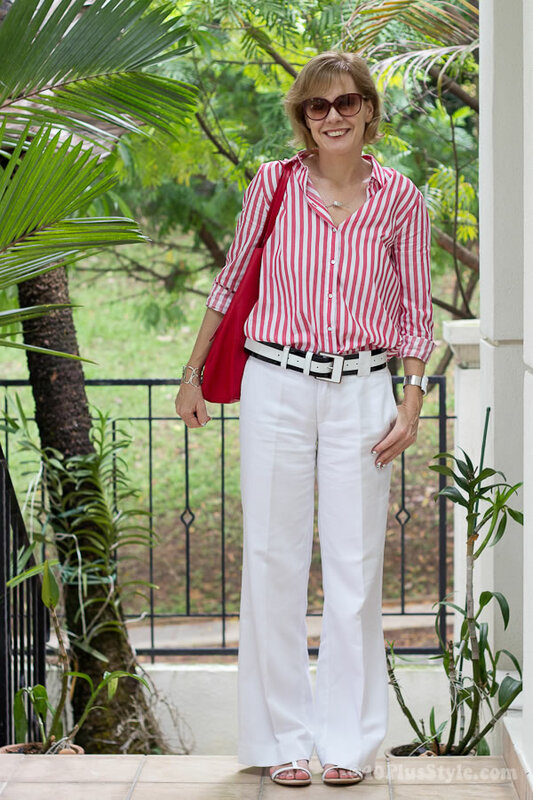 Red and white looks chic and understated. If you don’t want too much red close to your face, combine it with a white top. This is one of my favorite skirts and it combines with a lot of my tops like this white top from CK Calvin Klein. You can do the reverse if you do like to have red close to your face as I do as it brightens up my complexion. Same sophistication, just slightly different. White and red works well in a print too. Red is the perfect color to make a white dress more interesting and vibrant. For more glamour add a bit of gold into the mix! Many of you prefer black to white and that is a great easy option too. Red and blue is another versatile combination. Instead of a skirt, opt for some great blue jeans! More unusual is red with purple, but it is actually a really good combination as this look shows. More details on this outfit. Most looks are even more interesting when a third color is added. You can do so with an additonal garment, a print or an accessory. A chic color twist on my favorite asymmetric pieces. More details about this look. 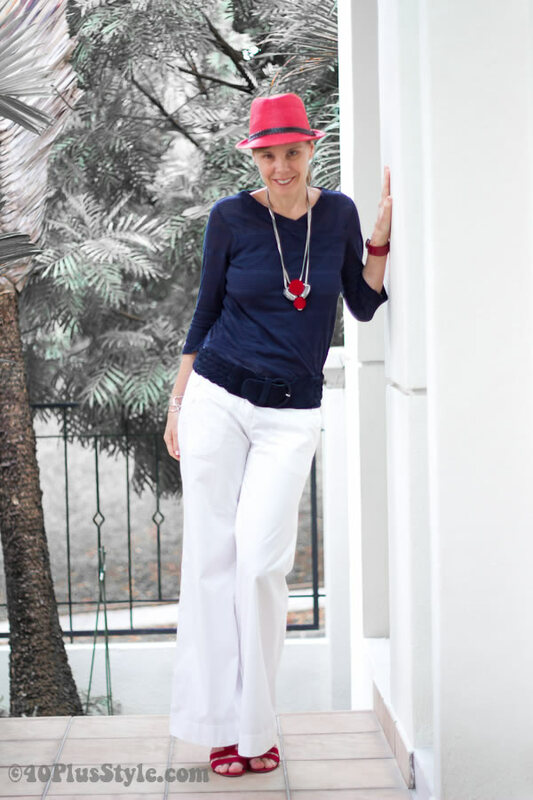 A very traditional and always chic combination is red with blue and white. It creates a marine look that is always in style. Black and white always works well with red and creates a more graphical look. A more unusual combination for an arty look. More details about this outfit. A more sophisticated and chic combination, especially if you add some animal print into the mix. Similar to above but now with white added into the mix for a slightly fresher look. Add a print into the mix! Adding a third color will often make your outfit more interesting and dynamic. This will be further enhance if you add some print as well. You can do that within your clothing or with an accessory or shoe. A chic floral jacket with jeans. The animal print shoes make this outfit more special. One of my favorite looks. Camel with red look super chic and the yellow makes it more funky. The animal print belt makes this outfit hip and modern. If you like a bit more of a color splash, you can play with the primary and secondary colors. This look is playful, fun and fresh. Mored details on this look. Sometimes you just want to stand out and nothing shows more confidence to the world than an all-red outfit. Red is not just for solids, it looks great in many prints too. If you prefer your red to be more muted you can also opt for a darker red like burgundy or marsala (which is actually the color of the year!). 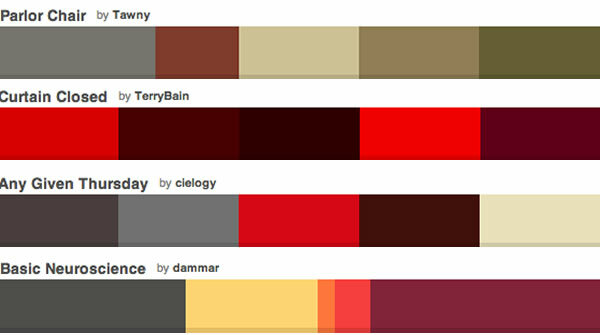 Here are some color palettes for wearing burgundy. Here is how you could appy the Curtain Closed palette. A beautiful color combination with the colors of fall. 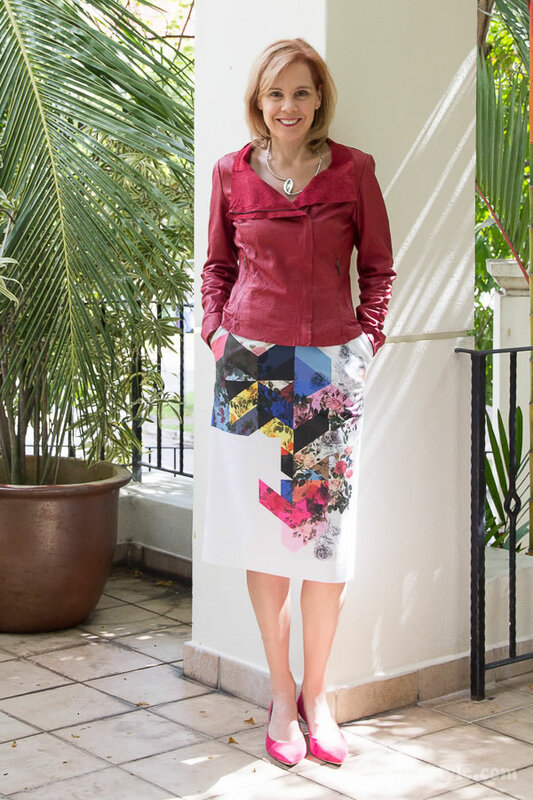 this woman combines layers of red with beautiful prints (photo by Denton Taylor). This is how I recently wore it. Do you find it hard to wear red? Try accessories! 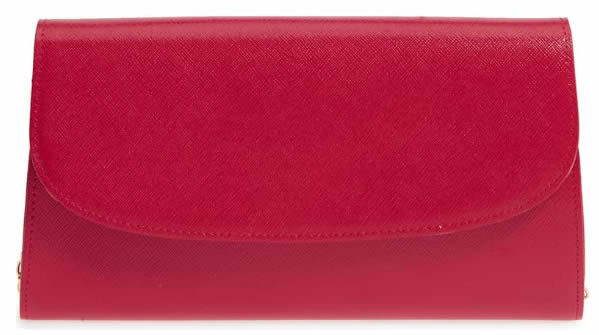 If red is normally not your color or you are afraid to stand out, then opt for a red accessory. It often really brightens up your outfit and adds extra interest. 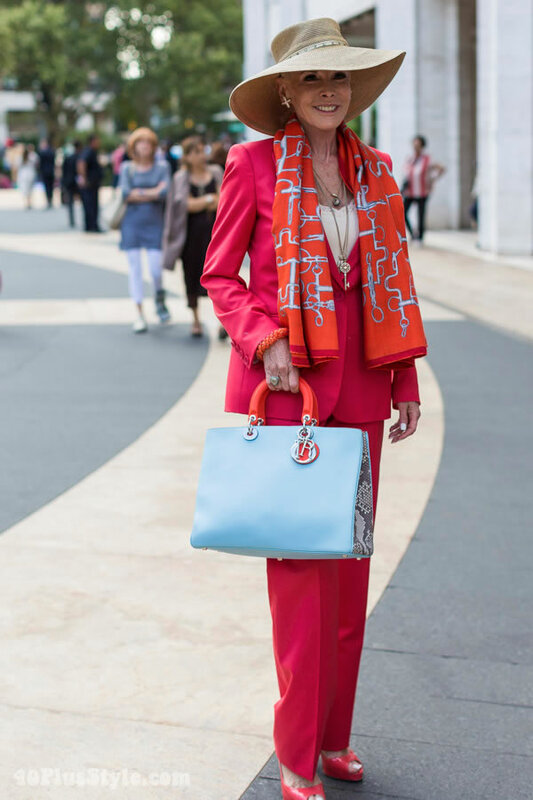 Look how much more fun and interesting this outfit is with the addition of a red bag! Adding red accessories is also a great tactic when you want to wear clothes that are not necessarily the best color for you. Wearing the gray without the red would be too bland for me. Sometimes all you need is a red necklace or pendant. I wear my red shoes a LOT. 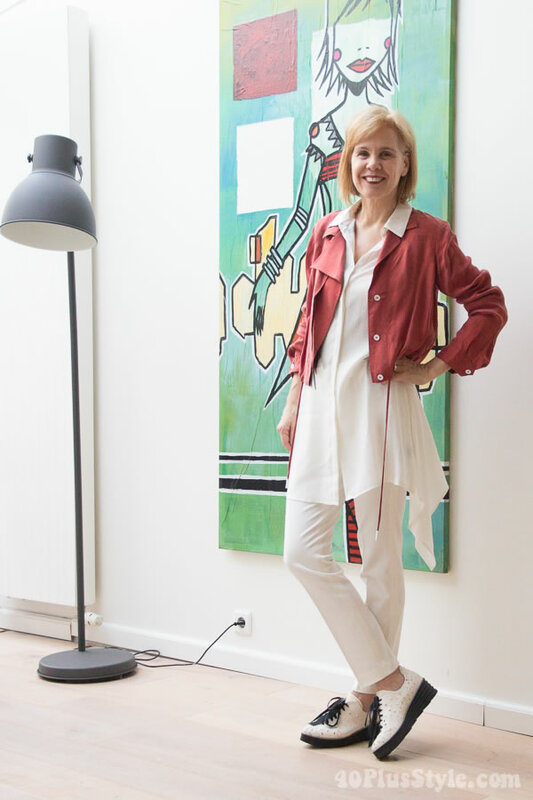 It’s so easy to make a neutral outfit more interesting by adding some red shoes! 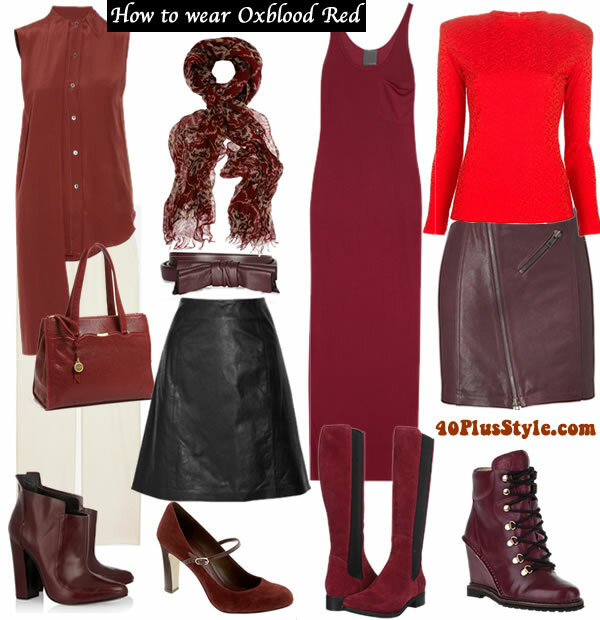 I hope this guide on how to wear red has given you some inspiration to wear this color! Perhaps you like to give it a go if you don’t normally wear it. Or you may try to wear it in a different combination from what you normally do. Below is a really helpful video from 40+Style stylist Ruth on how to find the best shade of red for you. Want more? We have a lot more training on color and choosing the right colors for you in the style club. Get access here. Do you like to wear red? What is your preferred way of wearing it? Like this article on how to wear red? Save it on Pinterest! I love all your articles, but this is my favorite to date, probably because I love red so much and feel it is a color that works well for me. Your combinations have opened a new vista for me. I have trouble thinking outside the box with color combinations and I’m excited by your choices. Love it, love it, love it! Thank you Sylvia! Lovely to hear from you Lynda and great to hear that this article has inspired you to try out new combinations. Mission accomplished! In US you have to be careful not to wear red white and blue, because you will look too much like our flag. No one wants to look like a flag. I wear red +white +navy all the time in summer. Never bothered anyone. The Dutch flag is red, white and blue… Great colour combination. I wear it a lot. Nobody thinks I look like a flag. Really, don’t worry about it. It is not an issue. Wow! You do have a whole lotta red in your wardrobe. I do think red looks great on blonds, which you’ve proven here. I like it, but it needs to be the right shade for me with my hair. I prefer it in smaller doses. There are a lot of repeat items though, just worn different ways…..
What you do with your grey dress to spicy it up is wonderful. ps…one of my faves that you just posted is the red necklace/bracelet with the black/white dress—easy & stunning!! Thanks for reminding me. I may as well include those recent looks too! Truly inspiring! You look great in red, in all these variations, Sylvia! I don’t have many red items, but I want to add red shoes and red dress(es). 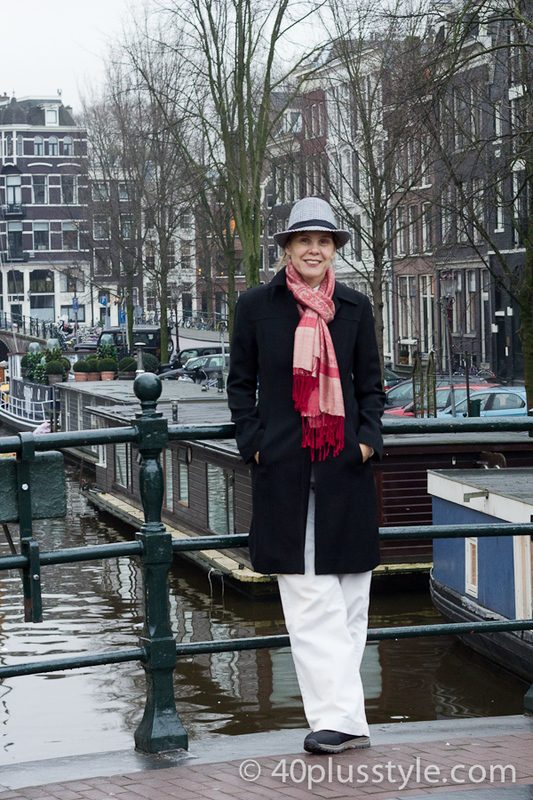 Like Suzanne, I select certain shades of red for myself, usually on the warmer side. So many great ideas here, I certainly will be back for inspiration. Love this post Sylvia. You have amazing taste, and lots of styling creativity! Just this morning, I was thinking about red. My fall/winter wardrobe is much better than it used to be, but my summer wardrobe needs some serious help. I thought maybe I should just limit myself to black, white, and red as a way of simplifying for the summer. That would allow me to get some good summer outfits together without spending a whole lot of money. I haven’t done it yet — I do like my colors — but it is under consideration. 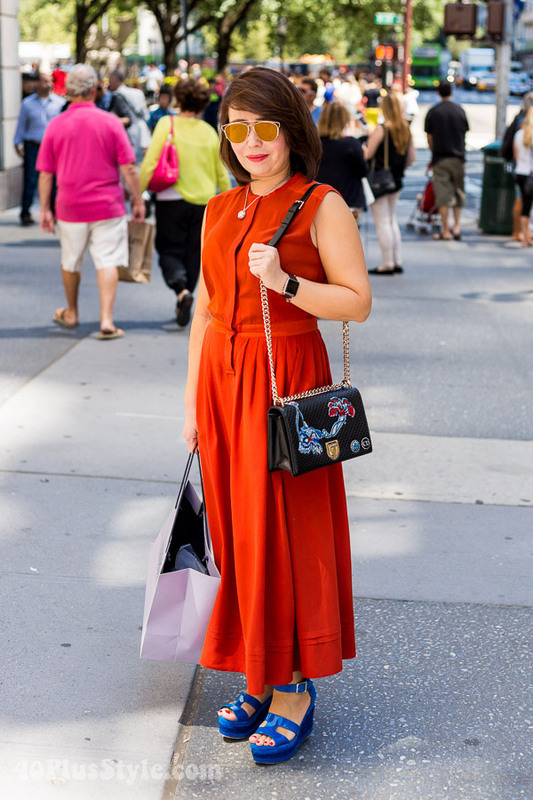 My favorite thing about red is that a little can go a long way in transforming an outfit! You are such a great model for the color red. I saw several of your styles which have inspired me and of course had to pin a couple. Excellent post! My goodness, this is an elaborate post. Thank you, very inspiring. I am deeply ashamed for using my red accessories so little. I have them, but I don’t use them. While I love red and red loves me. I am going to make a point of it to incorporate more red in my outfits. I love all the looks but I really love the red with white, green and yellow. Great article! Red is also one of my favorite colors. I love wearing bright colors during the summer there are so many combination to choose. I love red, but I think that it’s not an easy color to combine. But it can be fabulous if worn as a dress. If you like to see my choice search the post The woman in red Capannolo’s dress. What a great post, I love also red, but only as accessories. What a great post! So helpful to see the many options with red. 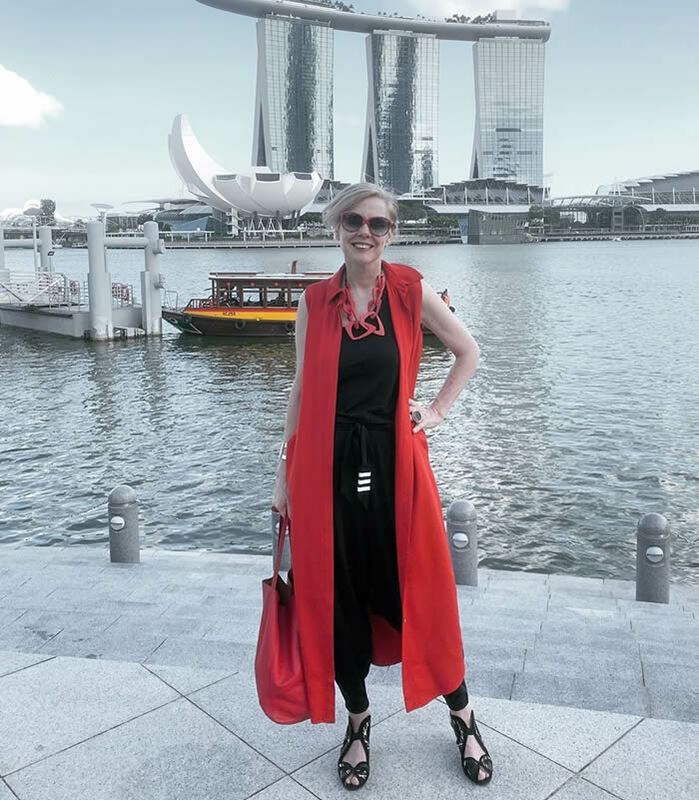 After not wearing it for years, I just rediscovered my love of red with the purchase of a vintage red bib necklace and a black and red silk YSL blouse from the 80s. My favorite look here is the red top with the blue skirt – blue and red and black and red are the combinations I feel most comfortable wearing. Yes, I do love to wear red. I don’t wear it much for work only some on Friday when we wear red until all our soldiers are home. I do prefer red for sporty type of activities. Also, red is my choice of colour on the weekend for going out or to parties. Not to church though. I don’t like red for my church clothes. 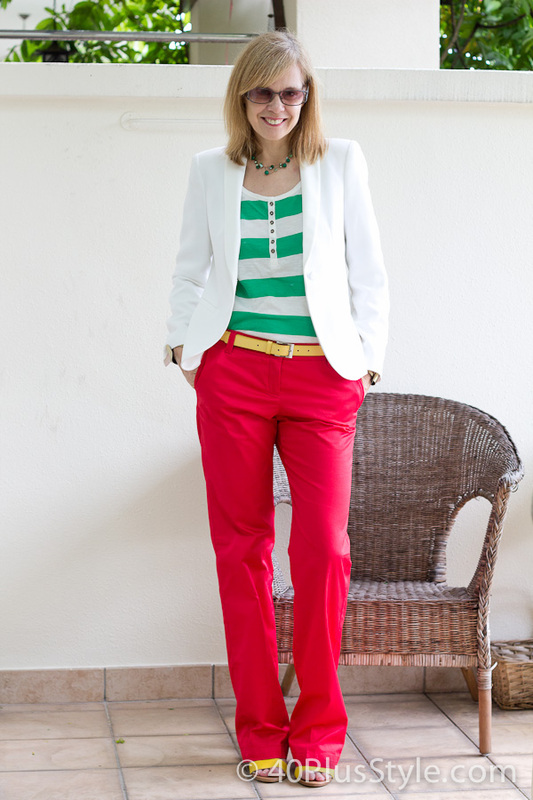 I keep red for athletic, dressy, vacation or evening clothes. IS a bright red long top, over a black top, ok for my sons wedding, a 2pm wedding. the brides mum is wearing bright yellow, im 56 years old with a warm skin tone. Yes a warm red can be a beautiful color for a wedding and will be good for your warm skin tone. I absolutely love your pink red outfit! I don t wear redcthat often. But I can see that red accesoires are a great addition! 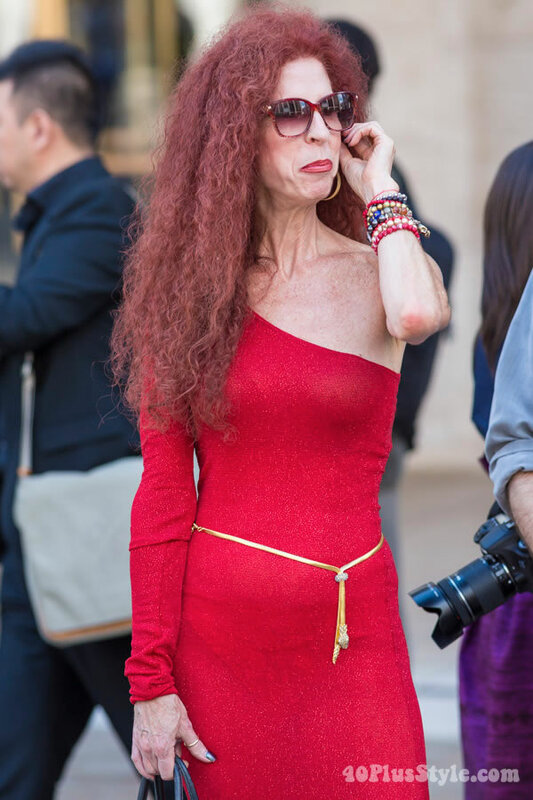 I’m 64 and wear red tops all the time, all different shades of red including bright red, why are some of you ladies so scared to be seen in red. I have dark hair and light olive skin, red is very flattering on me, I don’t care if your 80-if you like it wear it. We have earned the right to wear what we like. 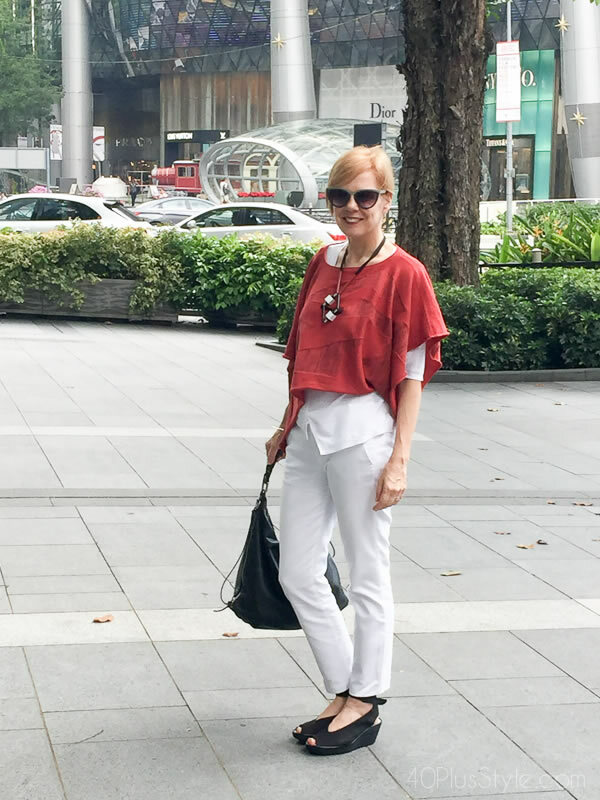 Previous post: How to enhance a basic outfit – See how I created 5 different looks with the same base!